The scene outside the Met at Museum Mile last year. I read that the 38th annual Museum Mile Festival in Manhattan happens on Tuesday, June 14 this year, from 6-9pm (rain or shine! 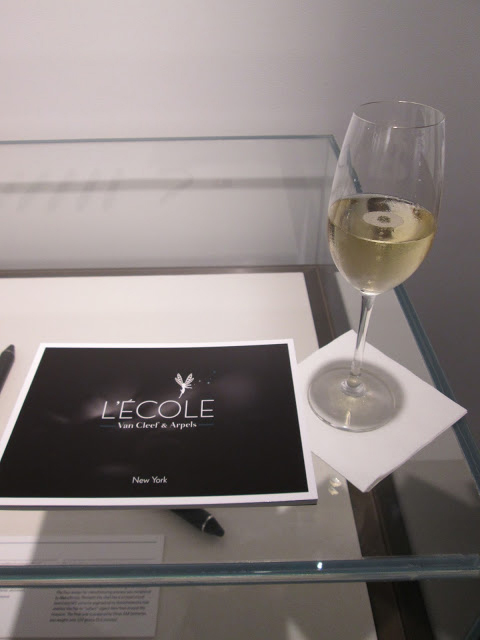 ), and I thought I’d share my photos from this event last year, when I inadvertently attended it, while on my way to the Cooper Hewitt Museum for the “Great American Jewelry Collectors, Then and Now” conversation hosted by L’École Van Cleef & Arpels. The Museum Mile Festival is a giant block party devoted to art, running from 82nd Street to 105th Street on Fifth Avenue and includes free admission to the Met, the Cooper Hewitt, the Guggenheim, and every other art museum up and down the street! There are also bands that will play and parts of the street that will be given over to kids and adults doing chalk drawings. Look left: kids get to chalk draw on the street wherever they like on Museum Mile night. It is a treat to walk along Fifth Avenue when it is traffic free! The weather was drop-dead gorgeous for this event last year and if you can, you should go. It can be a bit crowded around some of the museum entrances, so I’d suggest comfortable walking shoes, patience, and being willing to change your plans at the last minute. Everyone I saw—and I walked from the Met at 82nd Street to the Cooper Hewitt at 91st—was in a good mood and the crowd was a true mix of people from all the boroughs as well as tourists. It was one of those magical nights in Manhattan when you know you are so lucky to be there and you never want it to end; one of those nights when you are sure that New York City is the best city in the world! The Marymount School across from the Metropolitan Museum of Art. I think the Guggenheim had the biggest line to get in! The Museum Mile Festival was made all the more special for me since I got to attend a Van Cleef & Arpels jewelry lecture (is there anything better? ), but even without that happening this year, I highly recommend the Museum Mile event! I got to go into a separate entrance only for Van Cleef & Arpels lecture attendees. It is was not a bad way to end my Museum Mile walk by going into a side entrance of the Cooper Hewitt and then finding myself in a small group of people being handed hors d’oeuvres and Champagne. In fact, it was the best! My Museum Mile ended this way. Whee! Ruth Peltason (with mic) leading the discussion, which kicked off with Liz of course! You can read more about the Museum Mile Festival here. Let me know if you have attended it before, and if so, what you liked best about it! I would have loved to have heard that lecture at Lecole! I got to attend 2 of the VCA classes and it was a great experience! Hopefully you have another great time this year! I hope VCA has classes and lectures again in NYC! I was toying with going to the school VCA in Paris - I wanted to do a hugher level course but they make you do the basic course first - do you think it is worth it though? Coulda shoulda woulda, I got a lot out of my course. I took the one to identify gemstones. It was 2 parts and covered a lot of material. Some of the basic courses were too basic in my opinion as well. I definitely wanted a hands on learning experience! I wrote about my experience on my blog, if you'd like a more in depth look!